Muskegon Center for the Arts / Red Lotus Gallery will be hosting a Book Signing Event for Steve LeBel and his new book. 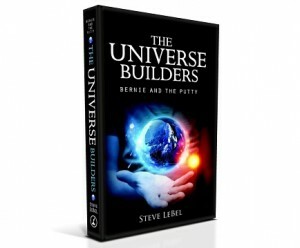 The Universe Builders is a humorous fantasy about Bernie, a young god who has just graduated from God School. Join him as he sets out to build his first universe. Is he up to the task? Perhaps. But what if another god is deliberately trying to sabotage his efforts? Food: Wine, cheese, and other good food will be available. Parking: Additional parking in the back of the building has elevator access. Additional copies of the book will be available at discount prices. Join us in celebrating Steve’s newest book. Bonus: The gallery will have a number of Marge LeBel’s paintings on display. So you get a two-for-one. Come and have some fun. Fresh with his diploma from God School, a young god tries to build his first universe. Plagued by a deadly enemy and aided by his friends, he struggles to make a world to be proud of. Previous Previous post: That’s a big relief!